Is it Manhole Season Already?! 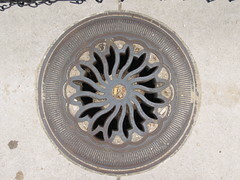 Usually, I associate manhole fires with the height of summer when everyone’s air conditioning is working overtime to cool the city from its swelter. However, Manhole season started early last night with an underground electrical fire between downtown and Columbia Heights. A supply line triggered a fire that shutdown power to over 5,000 homes in the middle of town around 11:30 last night. By dawn, most had power restored. Some, however, may be without power for days while the feeder line is repaired. The Morning News is on hiatus this week, and will return next Monday.